Carpet and Rugs are designed to be walked on, not peed on! 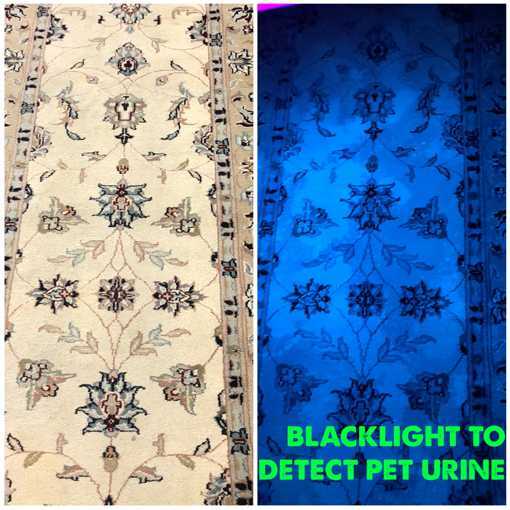 Color loss can result from the urine itself OR from at-home spotting attempts. Using over-the-counter cleaners only treats the tip of the surface fibers. Unfortunately, urine stains go much further into the flooring than just the carpet fibers. 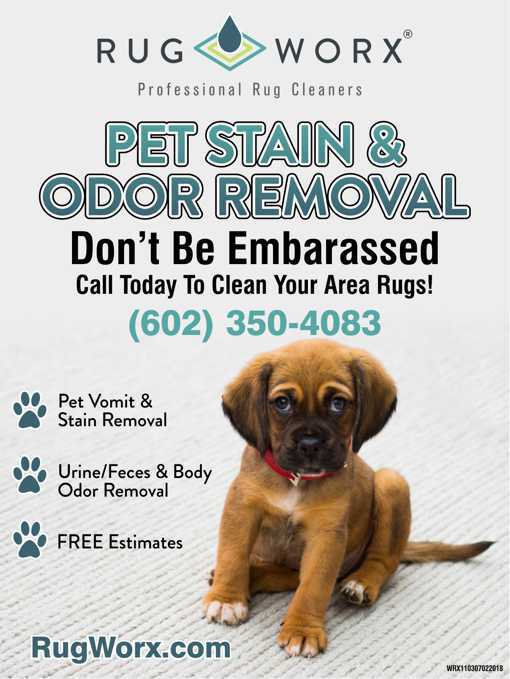 Urine spots and ODOR make their way into the carpet backing, carpet pad, and even into the sub-floor below the pad. We use UV lights to detect how severe the issue is and will educate you on what the options for cleaning are. The longer you let urine stains go untreated, the less chance you have of removing them and their odor. Hair can get embedded into the surface fibers as well as the backing of the rug. Pet hair is very difficult to remove completely. Regular vacuuming of your carpet and rugs will reduce the severity. Make sure to clean out your vacuum canisters OR change your vacuum bags out FREQUENTLY to ensure your vacuum is working properly! 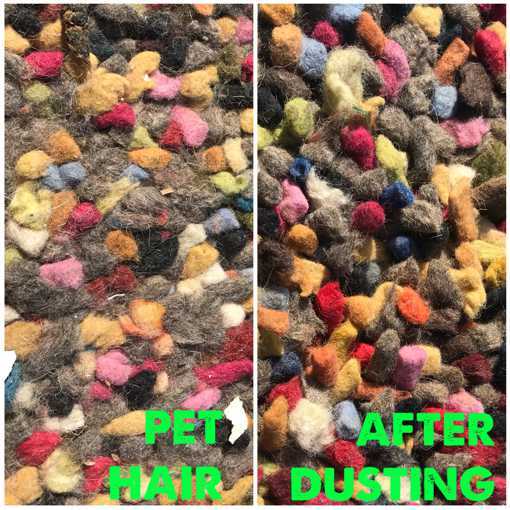 Don’t be afraid to use those fancy upholstery attachments on your vacuum to remove pet hair from your rugs and furniture. 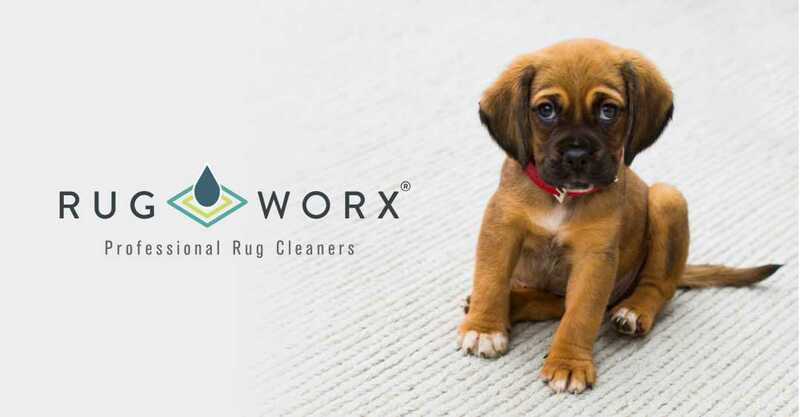 Pet odors don’t just come from urine…our fur babies have body oils and paws that emit odor and love to attach to our rugs, carpet and furniture. These odors and soiling are very tricky and cannot be removed without professional cleaning. The key is to catch them when they are FRESH. Pour water directly onto the spot. Cover with a dry towel & stand/step on it to soak it up. Repeat with several towels if necessary. Natures Miracle or Woolzyme. Don’t SCRUB – you don’t want to damage the fibers. Avoid harsh cleaning agents that may bleach out your carpet/rugs and have too high pH. The longer you let urine stains go untreated, the less chance you have of removing them AND their odor.